Wallpaper is a top trend but as both an interior decorator and professional home stager I have a varying viewpoint on using it in home décor. Is it in or out? I say it’s both. 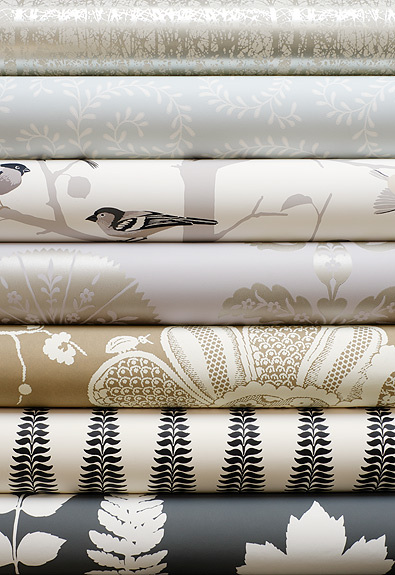 Schumacher Offers Beautiful Wallcovering Options From Classic Neutrals to Bold Patterns. OUT: As a professional home stager, I always recommend removing wallpaper when selling. Wall covering choices in interior decorating are custom picked for a homeowner and very personal; it’s rare a buyer and seller will share the same sense of style for wallpaper. When staging a home to sell quickly and for top dollar, we are neutralizing the property to appeal to a range of buyers. Outdated designs will distract buyers, make a room look smaller and give the home a dated feel. Instead of seeing the room’s features, buyers will be thinking about the time and effort they’ll have to spend or the cost of removing the wallpaper. Hiring a professional who can properly strip and prep the walls and paint a neutral color is a definite cost effective update that will make the home more attractive to buyers. These following spaces were all transformed into spaces buyers could envision living and demonstrate the importance of neutralizing a space before listing your home. This bathroom offers tremendous space and storage but buyers would be so distracted by the bold, blue cloud wallpaper they wouldn’t appreciate all the room’s features or envision it as their personal space. The dated wallpaper in this master bedroom makes the room feel smaller and is unappealing for younger buyers. Replacing the wallpaper with a neutral paint color opens up the space so the room’s size and features, such as beautiful hardwood flooring stand out to buyers. Buyers would be so distracted by the pink wallpaper they wouldn’t even notice the beautiful window seat in this additional bedroom. For more information on PJ & Company Home Styling’s decorating or staging services or to schedule an in-home consultation, please contact Patti Stern at 203-640-3762 or patti@pjstagingdecorating.com.